Successfully Added Dual Digital Camera + MP3 Player - 256MB Flash Memory to your Shopping Cart. A sleek looking, feature packed made in China gadget, with dual a 128MB MP3 Player and a 128MB 3.0M pixel digital combo. With a total of 256MB of internal memory, you will be listening to hours of music while taking multiple photos with this high-end wholesale product. Other great features include a web camera mode for chatting online, ID3 tags for the MP3 player, one 1.7 Inch TFT LCD screen for pictures and a dot matrix LCD for the MP3 player, and an included high quality camera carry bag. 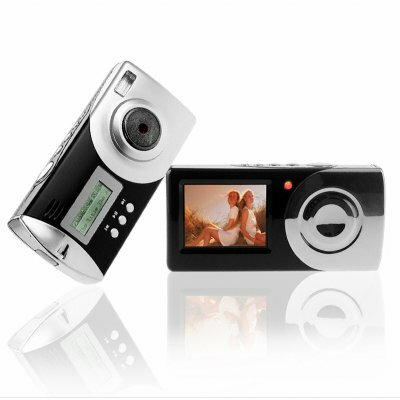 A cool looking gadget MP3 player and digital camera combo, direct from China to you at a super low wholesale price..